Allah says in His Glorious Book: “There glorify Him therein in the mornings and the evenings,” (24:36), i.e. glorify Allah at the sunrise of a new day and at its sunset, for this glorification reveals the connotations of the Divine magnificence to the human soul that is meant to interact with this magnificence in the line of full compliance and obedience to Allah. In this way, the entire day, from its beginning till its end, would be dedicated to Allah as a means of dressing oneself with the spirituality and magnificence of Allah in all the positions of His mercy. “Men whom neither merchandise nor selling diverts from the remembrance of Allah,” for the presence of Allah in their souls is much stronger than the presence of anything else, including the people and the work that preoccupy and dominate their lives. Whenever they mention the people, they mention Allah along with them, for they are Allah’s devoted creatures and servants and the ones whom Allah controls and bestows His blessings upon… Whenever they mention trade, they cannot but mention Allah in terms of the restraints He had set and the means of sustenance He had determined and wants His servants to pursue. In this sense, their work in trade, in buying and selling, does not turn them away from mentioning Allah; but rather, it further links them to Him. This is the character Allah wants the people to enjoy by instilling its authentic features within themselves, in a way that their relation with Allah is the strongest and above all other relations and that this relation is the only authentic relation that all other relations are subjected to, whether near or far, weak or strong. Thereupon, they would not indulge in anything away from Allah; on the contrary, their total dedication to Allah is what determines to them how much they can indulge in other people’s affairs and the like. “And the keeping up of prayer,” which is the act of worship that enables man to experience the presence of Allah, throughout his entity and life. “And the giving of poor-rate;” the financial act of giving derived from the spirituality of spiritual giving through which worshipping öAllah and wanting to attain a closer position to Him is manifested in the act of spending on the deprived people; thus, worship would step out of the state of the abstract self-indulgence in the horizons of Allah, and become a practical state in the reality related to one’s and others’ lives. “They fear a day in which the hearts and eyes shall turn about;” (24:37); i.e. the fright and terror of the Last Day that the hearts and eyes shall face; thus, they would tremble, shudder and become restless and dull as described in the following Ayah: “And when the eyes turned dull, and the hearts rose up to the throats.” (33:10). 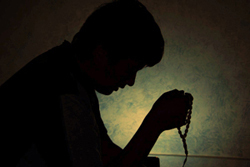 The issue in question is the fear that drives one to abide by the line of obedience and piety, and the terror that they shall face on the Day of Judgment that is mentioned repeatedly in the Quran as in His saying: “Surely we fear from our Lord a stern, distressful day,” (76:10), for the reality that Allah stresses while talking about the Day of Judgment in the Quran is the state of terror that shall prevail on that Day, and Allah knows best. “That Allah may give them the best reward of what they have done;” i.e., the ultimate aim of their work that conforms to the line of piety and full devotion to Allah and openness on Him is the best reward, in the sense that Allah gives them for every good deed a reward that is better and higher… To explain that, some interpreters say that Allah gives more and higher value to their deeds in the sense that He would not project them to what could devalue or diminish them; thus, He would count the good deed from among them as a better deed, and perhaps this is what is meant by the concept of increased reward, as in His saying: “For those who do good is good (reward) and more (than this).” (10:26). “And give them more out of His grace;” meaning the graces Allah might bestow upon them, although the deed they have done might not be worthy of such blessings, which brings us to the concept of endless Divine giving for not any return whatsoever mentioned in the following Ayah: “These are they that guard (against evil).They shall have with their Lord what they please; that is the reward of the doers of good.” (39:33-34). “And Allah gives sustenance to whom He pleases without measure,” (24: 38) referring to the blessings and sustenance He bestows upon the people from the positions of His Mercy that encompasses every aspect of giving in life, for Allah is the All-Generous Whose generosity has no end and He is the Most Merciful Whose mercy encompasses everything.